New Delhi: Congress on Friday alleged that over Rs 6,000 crore of "black money" was sent out of the country from a public sector bank here last year, two months after the NDA government assumed office, dismissing claims of Prime Minister Narendra Modi that there have been no scams in his regime. Demanding an independent probe into the matter, party spokesperson RPN Singh told reporters that the money was sent from 59 accounts in the Ashok Vihar branch of Bank of Baroda to Hong Kong. The Bank was not immediately available for comments. It was strange that the money was sent to buy cashew, pulses and rice from Hong Kong, he said. 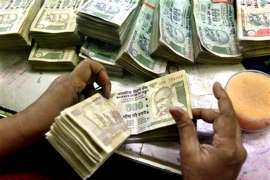 "Rs 6,172 crore was deposited in 59 accounts of the Bank in cash as advance. The money was sent to some selected companies in Hong Kong. No effort was made to verify if the goods were received or not," he alleged. Three of the companies are not traceable on the addresses mentioned by them, the Congress spokesperson said. Claiming that based on the inquiry report submitted by the Bank, government was aware of the scam for the past two months, he wondered as to why no FIR was filed in the case so far. He said such a scam could not have been carried out without the "complicity" of top officials in the banking network and the Finance Ministry. "One is forced to wonder as to how a government bank did not adhere to the very basic due diligence as regards deposits, transfers and withdrawals by any entity in any Bank," he alleged.